Originally drawn and written as a series of online poetic vignettes, UNSPENT LOVE addresses themes such as hope, fear, and human frailty. Evolving through numerous iterations, including a gallery installation supported by the Nick Novak Fellowship at Open Studio, UNSPENT LOVE most recently appeared as an experimental wall installation at YYZ Artists’ Outlet. One chapter of this work won first place in the graphic narrative category of This Magazine’s Great Canadian Literary Hunt in 2010. Conundrum Press is thrilled to announce the book version of the project, complete with a letterpressed wraparound jacket printed at Gaspereau Press. 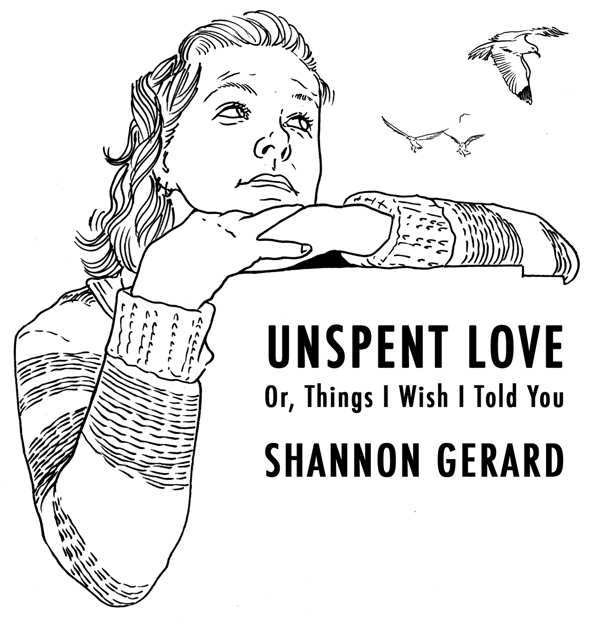 Embracing a variety of genres, from poetry to relational art to graphic novel, UNSPENT LOVE is as varied as the characters who populate its quintessentially human stories. Shannon Gerard’s work will be on dislay at YYZ until December 10, 2011. For more information and to track the YYZUNLIMITED project, check out Shannon Gerard’s blog at unspentlove.tumblr.com.